The Sakura Matsuri Japanese Street Festival, which is the largest one-day celebration of Japanese culture in the United States and marks the grand finale of the National Cherry Blossom Festival, will take place along the Pennsylvania Avenue between 3rd and 7th Streets, Northwest, on April 13. 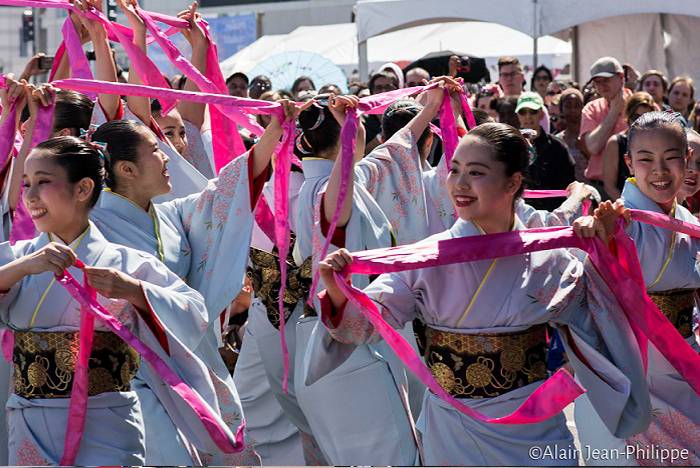 Performers and vendors visit D.C. from all over the country and the world to share their love of Japanese culture and traditions with the Festival attendees. More than 40 exhibitions and 30 performances are scheduled at four stages during the festival. Over 20 food vendors will offer a rich taste of Japanese cuisine, while the Arts and Culture Area will provide an experience of Japanese culture firsthand. Visitors can check out modern Japanese video games and anime culture at the Japan Now stall. Japanese-inspired handmade items can also be purchased at Ginza Marketplace at the festival. In 1957, a group of U.S. State Department officers got together privately with friends at the Japanese Embassy and established the Japan-America Society of Washington. They wanted to add a personal face to Washington’s official relationship with Japan and create a people-to-people organization. Over more than 150 years, Washington has been at the center of the U.S.-Japan relations. “This Japanese Street Festival began just four years after the Society’s founding as a small ‘friends and family’ bazaar. Today it is the largest one-day display of Japanese culture in the nation. Held each April as the climax of the National Cherry Blossom Festival, it stretches for six blocks through downtown Washington,” according to the festival brief. The festival now attracts about 40,000 people each year who visit the nation’s capital to participate in the event.